Terry Grosz is an award winning writer of 15 books and a legendary game warden. How we met and I ended up sitting on his porch interviewing him is a story unto itself. Last year I was in Bass Pro Shop here in Denver, Colorado, getting a headlamp for my wife. We became separated while heading up to the front of the store to check out and I became distracted by rows of booths set up near the cash registers. One of the booths was for a non-profit organization called Muley Fanatic Foundation (MFF), who are trying to help protect the Mule Deer populations of Wyoming and Colorado. A man named Scott was holding down the fort at that table and we talked a bit. I bought a raffle ticket and put my contact info in a jar for a chance to win tickets to a banquet they were hosting. Most importantly, Scott gave me a copy of Terry Grosz’s book No Safe Refuge. I started to read No Safe Refuge and found the writing to be not only engaging but the material to be almost unbelievable. The book is a compilation of stories of the most atrocious killing sprees by poachers Terry saw over his long career as a game warden. His methods for dealing with these killers are almost as mystifying as the question of why these men and women (sometimes men of the cloth) were killing animals in such great numbers to begin with. As Terry told me, “If these people put as much energy into something positive as they did into breaking the law they could do amazing things.” But the book was about killing for killing’s sake, and it does a great job of illustrating the cold calculated killing American wildlife. After reading the book Terry became an inspiration to me. His stories had sparked my imagination and shown me a world I didn’t realize existed. I thought it would be amazing to meet him, but didn’t give it much more thought than that. Then on a Saturday while Allyson and I were out at the store my phone rang with a number I didn’t recognize. I answered it, and on the other end of the line was Scott from MFF. He told me that a wealthy donor had given some tickets to the foundation so that interested parties could attend, and asked me if Allyson and I wanted to go. We said yes. The banquet was a really nice event with music, speeches, a silent auction, many different raffles, and a live auction at the end. However, my greatest surprise was seeing Terry Grosz there signing books. I was frustrated with myself for not bringing my copy that Scott had given me, but went up to talk to him anyway. While speaking to him I asked if he would mind if I interviewed him for Take a Walk and he said sure thing. I found over the time I spent with him that he is a gracious and giving man who would do most anything to help not only other people but nature and the animals that call it home. And that is the story of how I ended up sitting on the porch with Terry Grosz in Evergreen, Colorado, watching birds, ground squirrels, and other creatures run around his front yard. Now, Terry’s stories are already in his books. 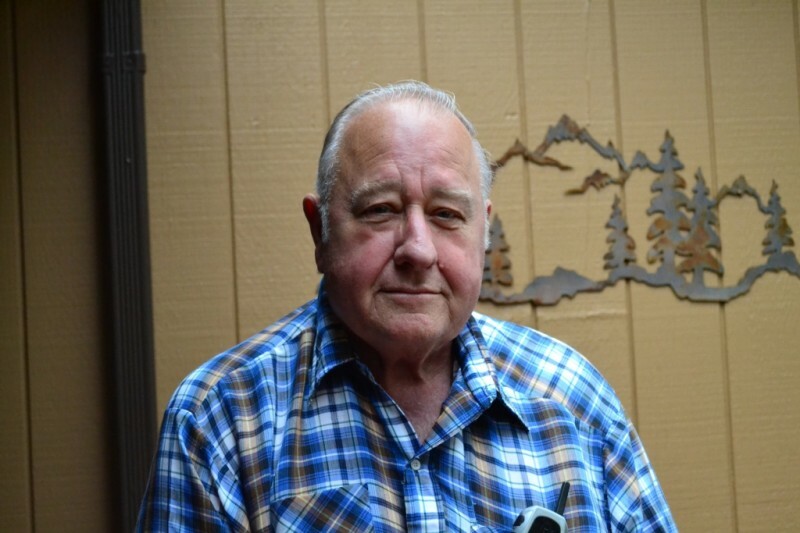 He has written thousands of pages of stories of his more than 30 year career in law enforcement as well as 5 books on the histories of mountain men. So when I went to meet with Terry I wanted to get to know how and why he wrote these stories down in the first place. What was his motivation? In the process I found out some incredible facts about his life, which I hope you enjoy reading about below. In 1959 Terry graduated from High School, which was no small feat since he worked so much from a very early age. His first job was at the age of 9 as a grave digger. Multiple times he told me that he was terrified a hand was going to reach up from the dirt and grab him while he was digging graves! He worked through all of high school in various odd jobs and was logging by the age of 16 (he had to lie about his age to become a logger). But he had a revelation, he told me, while he was out in the forests looking around at the men surrounding him. He realized he wanted an education so he could do something different with his life than dig graves and log trees. He told me that “he didn’t know what an education was” but that he knew he needed it to do something more with his life. But grades weren’t a strong suit for Terry in High School, mostly due to his focus on working. So when he went to look for universities to attend he realized he would need to go to a community college to get his GPA up before he could successfully apply to a 4-year university. Terry, a very focused and determined individual, did just this. He went to a local community college, did well, and ended up attending Humboldt University and graduated with a major in Wildlife Management. Little did Terry know that Humboldt University would award him with a Distinguished Alumni award in 2008 (his acceptance speech is on YouTube). When I asked him how he chose Humboldt and the degree of Wildlife Management he told me a story. He said that while at community college in Santa Barbara, California, he went to the library to look at college brochures. When he walked in the library he found the brochure table, he picked one up, and that first brochure was for Humboldt University. Said to himself, “I’m going to go there.” Then he opened the brochure up and the first page it opened to was the major of Wildlife Management; he decided that was going to be his area of study. This sort of determination and decisiveness has been a theme in his life. Terry told me that in eighth grade he saw a women come through the classroom door and he turned to his friend and told him, “I’m going to marry that girl.” His friend looked at him like he was crazy and told him that he didn’t even know who she was, so how could he know he was going to marry her. He told him, I don’t know how I know, but I’m going to marry her nevertheless. Over 50 years later, they are still married. His wife, Donna, is a school teacher with her B.A. and M.A. in Education. These stories of how he met his wife, how he decided to go into wildlife management, and how he decided to attend Humboldt University seem to be almost made up, but then again much of his life sounds sounds so fantastic that that it is hard to believe at times. In the end, the stories are so wonderful that even if they do have a little bit of a Big Fish aspect to them, we end up wanting to believe in them. In his career he traveled not only the country but the world. He worked in California, Louisiana, Asia, and the mid-west just to name a few. The food in Louisiana was great he told me when I asked him about his experience there. “They can make anything taste good, even an old shoe,” he remarked when thinking back to his Louisiana days. That made Allyson smile when I told her, since her home-state is Louisiana. The stories he told me were wild. Involving shootouts in Asia, close encounters with rattlesnakes, brawls with poachers, and more. It’s no wonder they made a TV movie about him! But I wanted to know how and why he wrote, so you’ll have to go buy his books to read more about his stories. One of the downfalls of his epic career as a protector of nature was that he didn’t have much time for his family. He called his career a “vision quest.” That he felt compelled to protect nature in a way that went above and beyond duty, but was elevated to an almost religious status. Because of this he spent 12 hour, 18 hour, 48 hour shifts trying to catch poachers and rule breakers, often missing out on events with his wife and children. When he retired he started a daily ritual of hiking up a hill just outside his house. I looked at the hill he pointed to and it looked very serene and like a good place to think, and think he did. He went over his career in his head and then, back at the house, felt compelled again to write down these stories. Terry told me that they were originally intended for his family, “so that they could know about what he did and who he was.” But like most things, when he began something he was all in, and in very short order a 400 page manuscript of wildlife stories emerged. He sent the manuscript around and it was eventually published. His family decided that the profits would go to a charity, but wasn’t sure which one. Terry told me that one day he was watching TV, and a commercial for Saint Jude’s came on. He knew in that instant that St. Jude’s was the charity that the money was meant to go to. Ever since, every dime according to Terry has gone to St. Jude’s Children Fund. What followed after that was a parade of more books and awards. His books became extremely well known in Sportsman and Wilderness communities; and he has had notable individuals such as General Schwarzkopf call his house and ask for books for gifts (70 books in General Schwarzkopf’s case). As it turns out, General Schwarzkopf is a big wildlife buff and loves big game — especially grizzlies. As we continued to sit there we started to talk about the birds Terry was feeding. A stellar jay flew in and scarred off many of the smaller chickadees and ring-neck doves; I tried to get a few pictures of the jay, but couldn’t really get a good angle. Terry told me he loved birds, loved studying them in college. When I asked him why he told me that they had such amazing physiology. I asked him what his favorite bird or even animal was and he told me that it would have to be the Golden Eagle. This bird can reach speeds of up to 200 mph, quite the flier! We talked a bit more about our favorite things, and Terry told me he had a fondness for geraniums, because they let you know if you piss them off; and that he loved Salmon, because they had this knack for overcoming obstacles to survive. This seemed to resonate deeply with Terry, and you can see it in his stories. The willingness and depth of Mr. Grosz’s actions to stop poachers and harmers to nature are legend. You can still see how strong and intimidating he must have been as a younger man, a lingering effect most likely of logging and digging graves starting at an early age. Today Terry continues to write and still takes walks near his home in Evergreen, Colorado. The following link to his first book can be found here to get a feel for his writing. His books can be purchased from amazon.com, alibris.com, or almost any other seller.